The Bank of Nova Scotia established operations in Puerto Rico in 1910 and in 1920 commissioned Nechodoma to design a bank building in the San Juan financial district. Nechodoma's creation was a departure of the Neo-Classical Style popular for banks in those days projecting images of safety, security and dignity. This design was progressive an daring. The entrance on the chamfered corner gives continuity to the two street facades and make them one. All the adornments; stained glass, mosaic work and floral ornaments are on the ground level leaving the three upper floors unadorned highliting the beautifully detailed sets of windows. It was not the first office building in San Juan but it surely was the first modern office building in San Juan. According to Thomas Marvel in his book Antonin Nechodoma, Architect, 1877-1928: The Prairie School in the Caribbean "...it was one of Nechodoma's finest overall projects. It complements the colonial architecture of Old San Juan with its simplicity and sincerity. Looking from a perspective of seventy years later, it had the right scale and level of detail that made it fit into its setting." 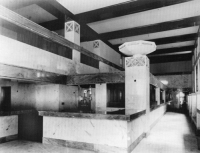 In the 1960's, the interior, of which an old picture is included in the gallery below, was gutted and modernized "unsympathetically" as Marvel most graciously puts it. The exterior though, remains today (January 2016) without significant changes.